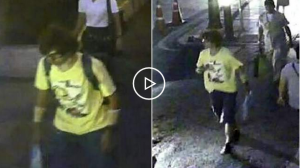 Video footage has emerged of a key suspect police want to question in connection with the deadly bomb blast in the Thai capital, Bangkok. The footage, from a CCTV camera, shows a man in a yellow shirt leaving a backpack in the Erawan Hindu shrine. At least 20 people died in Monday's blast, about half of them foreigners, and more than 120 were injured. In a separate attack on Tuesday, an explosive device was thrown at a pier in Bangkok, but no-one was hurt. Nationals from China, Hong Kong, the UK, Indonesia, Malaysia and Singapore are among the foreigners killed in the attack. In the new footage, he is shown carefully and deliberately removing his backpack inside the shrine, getting up without it and immediately leaving the scene. The spot where he was sitting is precisely where the bomb went off a few minutes later, says the BBC's Jonathan Head in Bangkok. "There is a suspect... we are looking for this guy," Prime Minister Prayuth Chan-ocha told reporters. Authorities were "quite close" to identifying the suspect, Thai government spokesman Maj Gen Weerachon Sukhontapatipak told the BBC, but other leads were also being pursued. He said no motive was being ruled out, but that the bomber did not appear to be Thai and the character of the bombing was "quite different" from previous bombings by southern Thai insurgents. The bomb was detonated at about 19:00 local time (12:00 GMT) on Monday when the shrine, and the nearby Ratchaprasong junction, were crowded. Monday's bomb was clearly placed to cause maximum casualties, says our correspondent in Bangkok.